Peloponese (Peloponissos) is one of the most interesting regions in Greece. Monemvasia is situated at the South East of Peloponnese. 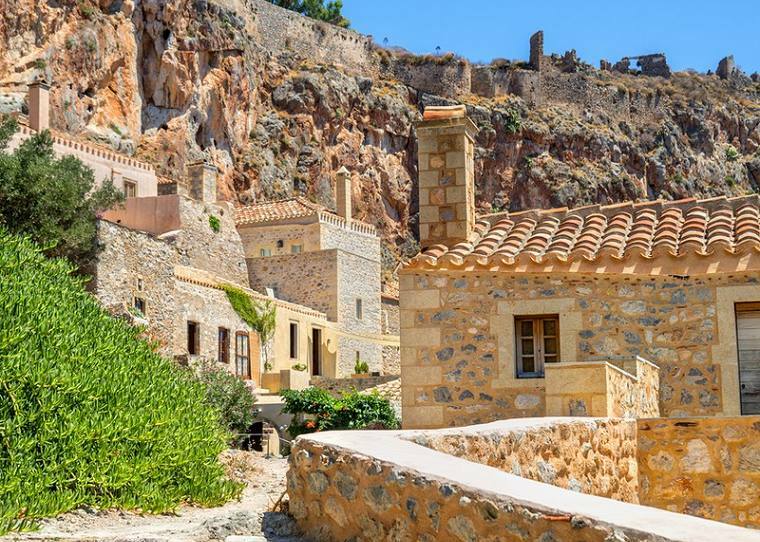 Monemvasia means 'single entry' and it can only be reached by a causeway and a road that winds around the base of the rock for about 1 kilometer before it comes to an abrupt end in front of the fortress walls. Monemvasia is a perfect destination for those seeking a place to relax in a magical atmosphere, rich culture and influenced by long history. Immerse yourself in a unique medieval atmosphere, watch the sea, leave your worries behind and relax. Peer into the history of the fortress, walk the narrow cobbled streets, discover a huge selection of nearby beaches, taste culinary delights at a fine restaurants, visit the the new town of Monemvasia and its surroundings other end of the causeway. 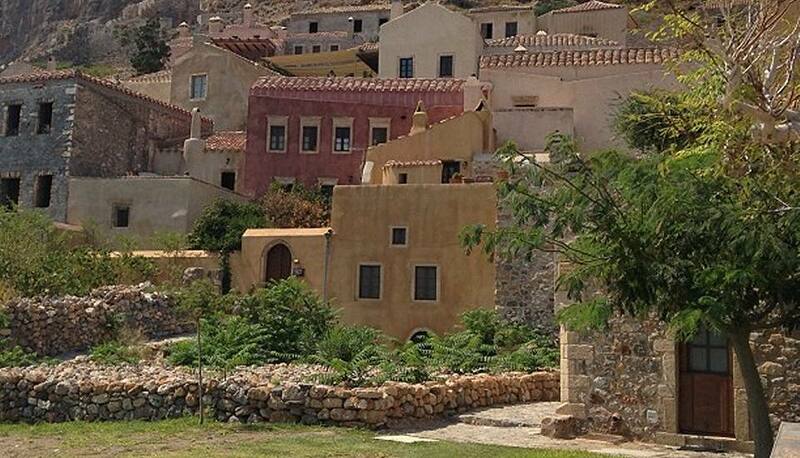 The traditional house "Goulas" is located in the old medioeval town of Monemvasia. 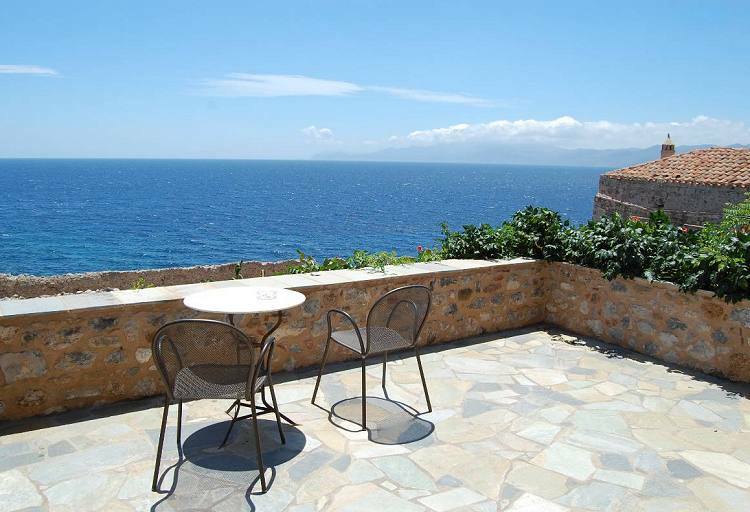 It has a beautiful sea view from the large terrace, the balcony and from the rooms. It can accommodate 10-16 people. All rooms have air-conditioning, television, refrigerator, coffee pot and a hot plate. Goulas Guesthouse is located at a perfect spot. It is only 3 minutes far from the entry of the castle and just 1 minute from the main square. Experience the wonderful view. Your balcony will be the kind of place you could hang out on day and night and never leave. Our warm and friendly staff will always offer you an excellent service. You will feel at home away from home. Explore this mystical stone-built settlement, nestled at the edge of a big rock by the sea and immerse yourself in a unique medieval atmosphere. Experience Goulas Guesthouse.